The WLA Traveling Choir travels to its newest association congregation (and farthest south), Trinity, Hartford (aka Huilsberg) on Sunday, Mar. 1, 2009. Trinity is south of Hwy 33 (and NW of Hartford) on the corner of Cty S and Goodland Rd. There is one service at 10 AM. You know all those little cross references in between the columns of your Bible? 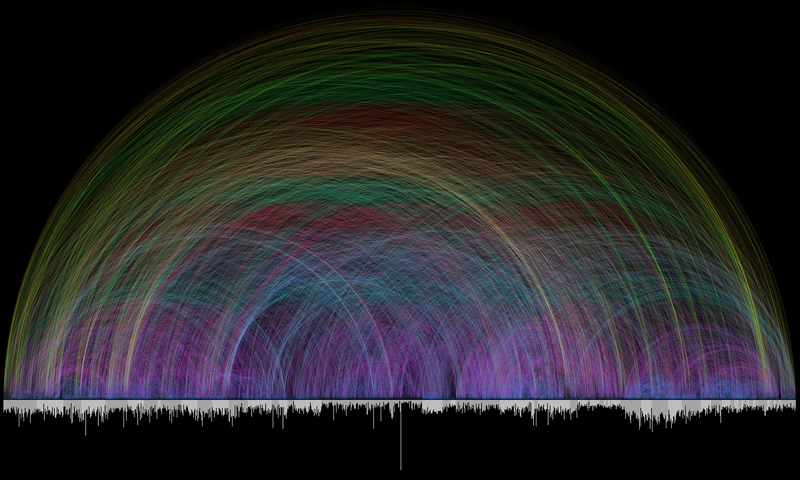 Chris Harrison and Christoph Römhild made a data set which visualizes all 63, 779 cross references in the King James Version of the Bible. Each arc represents one cross reference. The color of the arc is dependent on the proximity of the cross reference. The alternating white and grey bars across the bottom are the 66 books of the Bible and the length of the vertical lines in the books are the number of verses per chapter. The image won an honorable mention for illustrations in the 2008 International Science and Engineering Visualization Challenge. I have written on topic of "The Power of Music" three times before: (1, 2, 3). I am always interested in what other people have to say about the power of music in their lives and when I read this "Inspirational Speech on Music" last week I couldn't get through it without getting choked up. I record it here to save it for the future and to someday comment more to it. It was written by Karl Paulnack, the Director of the Music Division of Boston Conservatory, and presented as a welcome address given to entering freshmen there. "One of my parents' deepest fears, I suspect, is that society would not properly value me as a musician, that I wouldn't be appreciated. I had very good grades in high school, I was good in science and math, and they imagined that as a doctor or a research chemist or an engineer, I mightbe more appreciated than I would be as a musician. I still remember my mother's remark when I announced my decision to apply to music school-she said, "you're WASTING your SAT scores." On some level, I think, my parents were not sure themselves what the value of music was, what its purpose was. And they LOVED music, they listened to classical music all the time. They just weren't really clear about its function. So let me talk about that a little bit, because we live in a society that puts music in the "arts and entertainment" section of the newspaper, and serious music, the kind your kids are about to engage in, has absolutely nothing whatsoever to do with entertainment, in fact it's the opposite of entertainment. Let me talk a little bit about music, and how it works. Given what we have since learned about life in the concentration camps, why would anyone in his right mind waste time and energy writing or playing music? There was barely enough energy on a good day to find food and water, to avoid a beating, to stay warm, to escape torture-why would anyone bother with music? And yet-from the camps, we have poetry, we have music, we have visual art; it wasn't just this one fanatic Messiaen; many, many people created art. Why? Well, in a place where people are only focused on survival, on the bare necessities, the obvious conclusion is that art must be, somehow, essential for life. The camps were without money, without hope, without commerce, without recreation, without basic respect, but they were not without art. Art is part of survival; art is part of the human spirit, an unquenchable expression of who we are. Art is one of the ways in which we say, "I am alive, and my life has meaning." From these two experiences, I have come to understand that music is not part of "arts and entertainment" as the newspaper section would have us believe. It's not a luxury, a lavish thing that we fund from leftovers of our budgets, not a plaything or an amusement or a pass time. Music is a basic need of human survival. Music is one of the ways we make sense of our lives, one of the ways in which we express feelings when we have no words, a way for us to understand things with our hearts when we cannot with our minds. I bet that you have never been to a wedding where there was absolutely no music. There might have been only a little music, there might have been some really bad music, but I bet you there was some music. And something very predictable happens at weddings-people get all pent up with all kinds of emotions, and then there's some musical moment where the action of the wedding stops and someone sings or plays the flute or something. And even if the music is lame, even if the quality isn't good, predictably 30 or 40 percent of the people who are going to cry at a wedding cry a couple of moments after the music starts. Why? The Greeks. Music allows us to move around those big invisible pieces of ourselves and rearrange our insides so that we can express what we feel even when we can't talk about it. Can you imagine watching Indiana Jones or Superman or Star Wars with the dialogue but no music? What is it about the music swelling up at just the right moment in ET so that all the softies in the audience start crying at exactly the same moment? I guarantee you if you showed the movie with the music stripped out, it wouldn't happen that way. The Greeks: Music is the understanding of the relationship between invisible internal objects. I was playing with a very dear friend of mine who is a violinist. We began, as we often do, with Aaron Copland's [Piano] Sonata, which was written during World War II and dedicated to a young friend of Copland's, a young pilot who was shot down during the war. Now we often talk to our audiences about the pieces we are going to play rather than providing them with written program notes. But in this case, because we began the concert with this piece, we decided to talk about the piece later in the program and to just come out and play the music without explanation. What he told us was this: "During World War II, I was a pilot, and I was in an aerial combat situation where one of my team's planes was hit. I watched my friend bail out, and watched his parachute open, but the Japanese planes which had engaged us returned and machine gunned across the parachute chords so as to separate the parachute from the pilot, and I watched my friend drop away into the ocean, realizing that he was lost. I have not thought about this for many years, but during that first piece of music you played, this memory returned to me so vividly that it was as though I was reliving it. I didn't understand why this was happening, why now, but then when you came out to explain that this piece of music was written to commemorate a lost pilot, it was a little more than I could handle. How does the music do that? How did it find those feelings and those memories in me?" Remember the Greeks: music is the study of invisible relationships between internal objects. This concert in Fargo was the most important work I have ever done. For me to play for this old soldierand help him connect, somehow, with Aaron Copland, and to connect their memories of their lost friends, to help him remember and mourn his friend, this is my work. This is why music matters. The WLA Traveling Choir continues their tour of the 38 WLA Association congregations this Sunday, Feb. 22, 2009 by singing for the 7:45 and 10:15 AM services at St. Paul's, North Fond du Lac. Traveling Choir students are to meet at church at 7:00 AM for warmups. St. Paul's is located at 1010 Adams Ave. North Fond du Lac, WI, on the north side of Horace Mann High School. The WLA Academy Kids will perform from 1:00-1:45 PM on Sunday, Feb. 22, 2009 in the Expo Center of the Fond du Lac Fairgrounds for the 2009 Taste of Fond du Lac, sponsored by Horicon Bank. On Sunday, Feb. 15, the WLA Traveling Choir will sing for both services at St. Paul's, Brownsville, WI. The bus leaves WLA at 6:30 AM and will arrive at St. Paul's at 7:00 AM. Service times are 8:00 and 10:30 AM. TC will sing six pieces in two sets before the sermon in both services. The bus should be back to WLA by 11:45 AM. Want to make a Wordle? The sixteen members of the Winnebago Lutheran Academy Academy Kids will joined students from Manitowoc Lutheran High School, Kettle Moraine Lutheran High School, and Wisconsin Lutheran High School to sing for the opening service of the Conference of WELS Area Lutheran High Schools on Thursday, Feb. 5, 2009 at the Brookfield Sheraton.